No one should have to worry about sitting down in their favorite chair and not being able to easily get back up. Williams Lift Company has chosen to partner with Golden Technologies, the company behind various Golden recliner series, because they are made by Americans with domestic and imported materials, are backed by a strong warranty, and offer one of the most advanced lift systems available on recliners today. The Golden lift chairs currently have five different series to choose from, each available in dozens of colors and options. Having a Golden recliner in your home is all about peace of mind. Power recliner lift chairs ensure that you won’t have to worry about mobility when it comes to sitting down. These lift chairs are designed to make the process as easy as relaxing in the chair in the first place. What’s more, an emphasis on comfort and options make our lift chairs a no-brainer. One thing that sets us apart from other New Jersey recliner lift chair retailers is the fact that we go the extra mile for you– offering delivery and setup of your new power lift chair, right in your home or organization’s relaxation area. We understand that it’s not an easy process to pick out a new recliner, which is why we want to make sure that your new piece of furniture fits your needs as closely as possible. As with our stairlifts, a Williams Lift team member will work diligently with you to determine the power recliner lift chair that would work best for your situation. Once it’s been decided, you can narrow down other options, including color, size, and more. Lift recliners have continued to develop and improve to best meet the needs of their users. Recliner designers have also worked hard to make sure that their power recliner lift chairs are not only useful, but also attractive. Most recliners we offer can fit any decor. Gone are the days when accessibility furniture looked outdated or out of place. Many Golden recliner options, as well as other power recliner lift chairs on the market today, come in a wide variety of colors, fabrics, and styles. These options make our lift recliners an easy choice, especially when you have the help of the Williams Lift team to help you decide the best option possible. The Williams Lift Company wants all customers’ homes to feel as comfortable and welcoming as possible, especially to those who need assistance from time to time. 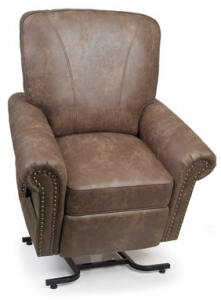 The power recliner lift chairs that we offer are some of the best available and have been hand-selected by the Williams Lift team to be a great option for you, your family, and guests in your home. If you’d like to learn more about Golden and power recliner lift chairs in New Jersey, please call us today for a free brochure at 908-322-7070.